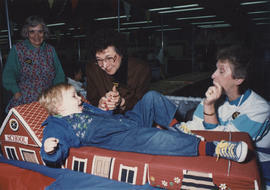 Photograph depicts a boy trying out a kid's flip flop bed with three women looking on. 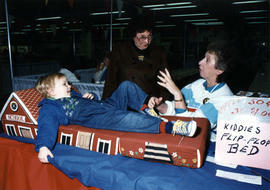 Photograph depicts a boy trying out a kid's flip flop bed with two women looking on. Photograph depicts a child playing with balloons. Photograph depicts a formal portrait of a boy. Photograph depicts a child with arms upraised (possibly after having released a balloon) in front of a pile of clothes. Children Shelly Balshine (12) and Kelly Permack (11) (Atid Chapter), Hadassah Bazaar, P.N.E. Photograph depicts Shelly Balshine (12) and Kelly Permack (11) holding raffle tickets. Photograph depicts children decorating a sukkah. Photograph depicts children decorating sukkah.